Like a heavyweight title fight, investment plans have a beginning, a middle, and an end. Do your clients’ plans have the dynamic risk-managed strategies and true diversification needed to take the financial punch that markets will inevitably deliver? Obviously, this applies to more than just boxing. It can relate to, among other things, your health, your relationships, and your investments. In light of the Tyson quote, what’s the best part of this description? That’s right! A true financial plan should provide help negotiating “the financial barriers that inevitably arise.” You know, like a punch in the mouth. Despite my FPA membership, my firm, Flexible Plan Investments, Ltd. (FPI), is not a financial planner, nor does it prepare financial plans. While we believe strongly in them, we are asset managers only. We provide the investment management of the assets assigned to us (stock, bond, and alternative mutual funds; variable annuities; and ETFs) to implement the investment part of the financial plan. I think every investor (or couple) should commit to working with their financial advisor on the rigorous development of a customized financial and investment plan. Yet, just like Iron Mike, I see many of them blow up when they hit adversity. Too often, the plans I see revolve heavily around buy-and-hold investing performed in a passive asset-allocation “plan.” Their sole answer to a “punch in the mouth” from a bear market is to hold on and take your punishment. The rope-a-dope did work for Muhammad Ali against George Foreman in the famous Rumble in the Jungle. Yet, Ali was very beaten up at the end of the fight, Foreman having inflicted “blunt-force trauma to Ali’s arms, upper torso, and kidneys,” according to Ali biographer Michael Ezra in an article for DeadSpin. These rope-a-dope financial plans place all of their faith in asset-class diversification to block the markets’ punches. This can be helpful in run-of-the-mill corrections. However, in the last two major bear markets (2000–2002 and 2007–2008), diversification into the popular defensive investments of the time periods failed. For example, when stocks fell in 2007 and 2008, among all of the possible asset classes that inhabited “well-diversified” portfolios, only gold, cash, and government bonds managed gains. Everything else tumbled along with stocks. Even the traditional balanced portfolio of stocks and bonds declined 24% from October 2007 to February 2009. The savagery of the 2007–2008 equities bear market caused investors to abandon equity mutual funds. Many investors have never returned. In 2007, $23.8 billion was withdrawn from U.S. equity funds, and another $65 billion was withdrawn in 2008. 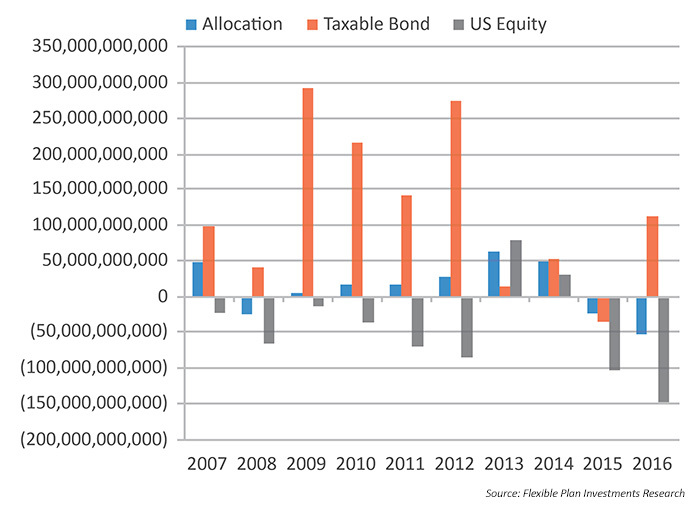 Even those mutual funds that were helping investors plan ahead with balanced or asset-allocation funds saw their investors head for the exits in 2008. Obviously, even if these funds experienced smaller losses in the decline, it wasn’t enough to cause investors to resist the fear and stick with their plan. Of course, in an example of the worst of ironies, when stocks got off the mat and came slugging back in 2009, investors did not. Investors were already counted out before the next round began. Furthermore, it was not until 2013 that stock market funds began to see net new additions. And inflows to stock funds did not exceed inflows into bond funds until that same year, this despite a 200%-plus rally in stocks as they outperformed bonds in the period by over six times. Let’s go back to basics. A plan is like a story. To qualify, it must have a beginning, middle, and an end. In the case of a financial plan, it begins with the decision to invest. It moves on to having a strategy for sticking with the plan. And it ends when you achieve your goals—buying that house or sending the kids to college, for example. Sometimes it ends when your goals change. For example, you begin with a goal of accumulating assets for retirement. Your goal then changes upon reaching retirement; it becomes one of preserving your assets for a lifetime and earning income or withdrawals enough to sustain your lifestyle throughout. Each part of the plan can be difficult to stick with, especially when you are “punched in the mouth.” And investors are susceptible to this during any one of the three stages. Committing to act at the beginning of an investment plan is difficult. This is especially true for more-experienced investors. They come to their financial advisor with varying investment histories. All investments have been “punched in the mouth.” They have periods of decline. Even money stashed in a bank account or T-bill declines in its purchasing power due to inflation. Thus, most investors have been knocked out at least once in their lives. And, with 50% stock declines twice within the last century, many have been hammered more than once. I understand. It’s very difficult to invest again in stocks when this has occurred. You might think that bonds, then, are the answer. The buying behavior of mutual fund investors following the last stock market crash certainly makes clear that this is the thinking of most. Yet, this century—in fact, for the last 34 years—the bond market has been locked in a secular bull market. This is primarily the result of well-controlled inflation during the period and the two stock market crashes that put the Federal Reserve into protection mode, lowering interest rates (and raising bond prices) for most of the period. But the future seems likely to differ from this past: By the end of 2015, interest rates had fallen to near zero. Commodity prices had tumbled with them. New spending looms in Washington. Demand for borrowing and commodities are likely to rise, driving prices higher. Oil and gold both finished 2016 rallying. And the Federal Reserve has already embarked on its plan to raise interest rates into the foreseeable future. Such events do not augur well for bond investors. The prospects for the bond market mean that more investors might need to consider adding stocks and gold to their investment plans. And doing so with dynamic risk-managed strategies makes it easier to step back into the ring. Why? Because such strategies always have the means to actively adapt to the market environment with a goal of reducing risk. Once advisors and clients have started to implement an investment plan, the most difficult part may be the next phase: the middle—the “sticking with it” part. Just think of those New Year’s resolution plans to diet or to stop smoking. It’s just a few months into the new year, and how many have already given up on those plans? It is no different with one’s financial plan. In the middle, “life happens.” And, as Mike Tyson pointed out, it’s how you respond to the left hook the financial markets hit you with that determines whether you will stick to the plan. In 2016, we saw the biggest sell-off in stocks ever to begin a new calendar year. Then the passage of the Brexit and the Trump victory took the world by surprise, followed by double-digit rallies in stocks, gold, oil, and the dollar. And then, of course, there was that reversal in direction on interest rates by the Federal Reserve. If you were a buy-and-hold investor in bonds (which didn’t do well in 2016) and stocks, did you have doubts about your investment plan throughout 2016’s surprises? If you were in an investment strategy or strategies, did you stick with them in the face of these challenges? Just as starting over with a new plan can be most difficult for older investors, younger or new investors can have trouble with this middle part. If they have never been through any investment trials, they may not have developed the fighting skills yet to stick to the plan in the face of a flurry of punches. While many of these younger investors may not have personally experienced market volatility before, the current younger generation may have paid attention to their parents’ investment struggles. If so, even if they are not now experiencing the “middle” troubles, they may be experiencing the same “beginning” difficulties. Portfolios of dynamic risk-managed strategies, each responding to different market environments and not necessarily moving together in the same direction, can help investors stick by their plans. This true diversification can reduce volatility and short-term losses, making it easier to use one of a fighter’s best weapons: the ability to hold on. In creating the portfolio, though, don’t forget that a truly diversified portfolio of assets or strategies should never have all winners or losers in it. If it does, it’s probably not truly diversified, nor will it likely provide protection for the unknown future. Finally, there are the challenges of the “end” of the plan. Is it the ending that an investor planned for, or is it an ending that was brought on by a “punch in the mouth”? Was it unplanned-for volatility or a lack of true diversification that ended it? Was it not well-matched to an investor’s suitability profile? Any of these factors can result in a plan coming to an untimely end. We believe that for investors to start any investment plan, stick with it throughout the middle, and see it end profitably, the plan must involve (1) dynamic risk-managed strategies, (2) diversification among strategies—not just asset classes, (3) relentless reliance on a personalized, goals-based process, and (4) supporting educational reinforcement. Dynamic risk-managed strategies are necessary because the financial environment is constantly changing. Investors need to have strategies that can adapt to those changes and reallocate responsively, not reactively. Just as diversification of asset classes can be a line of defense, a portfolio of many actively managed strategies can build an outer wall to deal with market volatility and changing financial demons. Having a personalized benchmark provides investors with a customized measure to gauge their progress. It gives investors a quantified way to determine if their portfolio is on-target with their (and their advisors’) initial expectation for their investments. Understand that a strategy, too, is a plan. It has a beginning, middle, and an end. Each strategy has a buy discipline to initiate the investment, a hold discipline to stay invested while reducing volatility to allow investors to stick with it, and a sell methodology to know when to end a trade and reallocate. Each strategy is a well-researched plan designed to survive the volatility inherent in financial markets to attain the goals we seek from our investments—even when those same markets dance around the ring trying to punch us in the mouth.